EITCI Institute, acting towards increased proficiency in IT skills among citizens and organizations, is governing and licensing basic and advanced IT Certification Programmes, which are commercially and non-commercially available to individual or institutional customers over the EITCI Licensee Network (no commercial services are offered directly by the EITCI Institute). EITCI Certification Programmes are dedicated to professional productivity increase, as well as counteracting digital exclusion in international society. EITCI Institute is commited to sustained development of Certification Programmes contents, methodologies and quality standards. The EITCA Academy Certification Programme constitutes series of specific EITC Certification Programmes, in relevant IT disciplines. All Certification Programmes are available in a commercial and non-commercial offer not directly from the EITCI Institute, but within the EITCI Licensee Network. EITCI Certification Programmes are developed to cover practical, novel IT areas with a high quality curriculums developed by expert academic/industrial committees in accordance to guidelines of the “Digital Agenda for Europe” by the European Commision of the EU, including open educational e-materials, distant learning, examination & certification services. Important characteristic of the EITCI Certification Programmes is their vendor independence, thus focusing on the quality of IT skills rather than interests of specific technology vendors. EITCI Certification Programmes are available across the European Union by means of distant learning and specifically designed distant examination processes on Internet platforms. Information technologies proficiency among citizens is a key factor in dynamics of Information Society development and further economic growth. EITCI Certification Programmes are accessible on-line over the Internet (leveling physical barriers in access) and are targeted at individuals and institutions, enabling formal documentation of information technologies competencies. Due to specially designed fully on-line certification procedure preserving high quality of the certificates, there is no need to undertake EITC and EITCA examinations at physical location, which is an important factor in overcoming individual barriers and ensuring accessibility of IT certification services to everyone. In accordance with the Digital Agenda for Europe (DAE, Communication of the European Commission to the European Parliament, the Council, the European Economic and Social Committee and the Committee of the Regions, COM (2010) 245, Brussels, August 2010) ICT competencies form the basis for the development of the information society in the EU economy based on knowledge (KBE). According to the latest Eurostat survey, 30% of EU citizens (i.e. as much as 150 million Europeans) do not have yet required ICT competencies, making it for them difficult to function in a modern, common labor market, as well as posing as a serious obstacle to professional and personal development, constituting even a risk of a social exclusion (understood as inability to overcome barriers in access to new social services in the areas of e-learning, e-government, e-health). ICT competencies held by the remaining part of the EU citizens are not sufficiently focused, sophisticated and targeted, and are also subject to rapid obsolescence (becoming obsolete increasingly fast, due to shortening of the modern Information Technologies lifecycles). Because the ability to use Information Technology is the most important, a so-called key competence of fundamental importance for the knowledge-based economy (European Parliament and Council Recommendation of 18.12.2006 on Key Competences for Lifelong Learning 2006/962/EC), the main message of the Digital Agenda for Europe, which is a pillar of the new development strategy for the European Union ( "Europe 2020 - Innovation Union"), is to significantly enhance the continuing education of Europeans in the field of Information and Communication Technologies (ICT/IT), leading to a noticeable increase in the number of people with high qualification levels in relevant IT domains, while also improving the quality of education at the pan-European scale of IT Certification Programmes, using effective digital methods (in particular e-learning), as well as with the support of the EU funds of the European Social Fund (ESF) and the European Regional Development Fund (ERDF) funding programs, for the decreased costs of tuition (DAE especially calls for the increased number of people with professional compencies in IT field, and its many areas, including Internet technologies for teleworking, e-business technologies necessary for innovation and economic growth, information technology security, computer graphics, and others - and at the same time raising the quality of education at the pan-European certification programmes level). With funding from the EU funds (ERDF) amounting to as much as 80% of costs, the EU wide implementation of the European Information Technologies Certification Academy Programme EITCA accredited and governed by the EITCI Institute in Brussels, allows for significant reduction of barriers in access to leading EU based IT experts developed high quality curriculums of IT competencies in the practical areas of their commercial and technological applications. The European Commission sets within DAE a particular emphasis on the need of ICT training of 30 million women aged 15-24 years in order for them to enhance the competitiveness of the IT sector in terms of training (especially in the fields of manufacturing and design technology), and this goal is part of nationwide initiative euroKobieta ESF co-financed and extended in the direction of promoting teleworking among women. In accordance with the recommendations of the Commission should be made aware of all the citizens of the potential of ICT for all types of jobs that are becoming more and more virtualized in a modern information society, knowledge-based economy (KBE). This requires the creation of multi-stakeholder partnerships, to strengthen education, recognition of competences in formal education and formal training systems, as well as raising the level of knowledge and effective training and certification in the European ICT outside formal education systems, including the use of online tools of e-learning for retraining and continuing professional development. These priorities are one of the pillars of the flagship European Union growth strategy - Europe 2020 "Innovation Union". Key Action 10: Recommendation to prioritize skills and competencies in the use of digital technologies in the Regulation on the European Social Fund (2014-2020). Key Action 11: Develop until 2012 tools for the identification and recognition of competences of ICT practitioners and users, linked to the European Qualifications Framework (Recommendation of the EP and of the Council of 18.12.2006 on key competences for lifelong learning life) and Europass (Decision No 2241/2004/EC of the EP and the Council of 15.12.2004 on a single Community framework for the transparency of qualifications and competences, Europass) and the development of a European framework for ICT-related professions to improve the ICT skills of professionals in Europe (based on the ECDL standards, EUCIP, EITCI, EITC , ECCC). 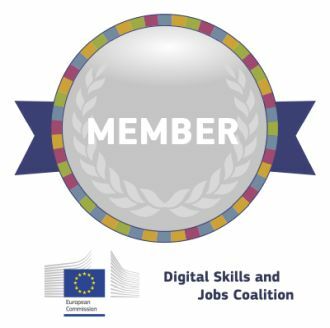 Establishment of digital literacy as a priority for the "Agenda for new skills and jobs" to be launched in 2010 (New skills for new jobs, COM (2008) 868, e-skills for the twenty-first century, COM (2007 ) 496 and the closest to the Europe 2020 flagship), including the establishment of a multilateral sectoral councils for skills and employment in the field of ICT, including the dissemination of standards developed competences in teleworking. Promoting increased employment in the ICT sector of young men and women returning to work by promoting online learning resources, e-learning and dialed contacts on social networks. Propose until 2013 indicators competences and media literacy across the EU. Development in 2011, the online tool used for consumer education in the field of new media technologies (including such rights of consumers on the Internet, electronic commerce, data protection, media literacy, social networks, etc.) This tool will provide customized information and educational materials for consumers, teachers, and other communities in the 27 Member States. Introduction to the 2011 long-term measures for e-skills and digital literacy and the introduction of appropriate incentives for small and medium-sized enterprises and disadvantaged groups. Inclusion of e-learning in the mainstream of national policies for the modernization of education and training, including in the curriculum, the assessment of learning outcomes and professional development programs for teachers and trainers. EITCI Institute’s authority as an accrediting and certifying institution in information technologies domain finds its confirmation in horizontal programmes implemented by the European Union public administration and public education sectors. The EITCI Institute, due to cooperation with IT professionals holding advanced expertise in the ISA/IDABC programmes of the European Commission (EC) is able to offer the unique certification programme for electronic public administration and government, being under implementation in member states of the EU. The EITCI Institute is also engaged in publicly financed initiatives, aiming at improving information technologies related education within nationally accredited secondary and academic level scholar institutions (e.g. high schools, vocational schools, colleges and universities). Due to engagement of internationally recognized experts and academics in the field of advanced information security, as well as applications of information technologies to business and administration, the two corresponding EITCI certification programmes hold unique value in an international scale. The commercially available IT certification programmes are organized topically, addressing different areas of specialization. The EITCI Institute offers two models of certification. The first model, known as the European Information Technologies Certification Course EITC programme, implements skills and knowledge certification in a very particular and narrow area of IT specialization. The second model, known as the European Information Technologies Certification Academy EITCA, implements on the other hand a broad coverage of a particular information technologies discipline, embracing series of several (up to 12) subjects, individually of a narrow specialization and jointly certifying skills and knowledge within the corresponding domain of IT, thus formally acknowledging the certified party’s level of proficiency in the particular discipline. The information technologies proficiency among citizens is a key factor enabling sustained Information Society development and supporting further economic growth in global terms. All IT certification programmes of the EITCI Institute are accessible on-line over the Internet (within the EITCI Licensee Network), helping to level off physical barriers in access. Both the commercial and non-commercial IT certification programmes are targeted at individuals and institutions, enabling formal documentation at the international level of information technologies skills and competencies by individual persons or organizations’ staff. Due to on-line testing and examination methodologies, procedures and technologies, the EITCI Institute assures highest level of trust and quality for the certification standard. There is no need to undertake the EITCC and the EITCA examinations at physical locations provided legal adherence to the terms and conditions of the EITCI Certification License Agreement and associated procedures. This approach stands as a key factor in overcoming individual barriers and increasing accessibility to IT certification services for all interested parties at the international level. The EITCI Institute’s headquarters is located in Brussels, Belgium, however all of the certification programmes offered by the Institute are available globally on-line over the Internet within the network of partnering IT training institutions and examination centers (associated within the EITCI Licensee Network). Please note that the EITCI Institute does not commercially offer any of the certification programmes to individual or institutional customers directly. Instead the only commercial offer for individuals and institutions interested in obtaining EITCI IT certifications is available indirectly within the EITCI Licensee Network, assembling cooperating institutions (the licensees), implementing access to on-line certification procedures at the national level in the European Union and abroad, eventually extended by appropriate certification programme compliant training and preparatory services (within both stationary or non-stationary models). The EITCI Institute’s IT certification programmes are developed to be complementary with existing industrial IT certification standards and to prove an added value in formal documentation of information technologies proficiency of an individual or an organization. The contents of the EITCI certification programmes are based on the most recent achievements in many areas of information technologies applications, and are periodically updated to keep up with the latest developments. The constantly revised programmes correspond to the best international universities standards. All of the programmes are always developed in a joint cooperation between industry professionals and academic experts, which assures a practical value concerning industrial applications of technologies, and on the other hand, exceptional level of theoretical coherence and background comparable only to advanced computer science educational programmes in world class universities. The EITCI Institute is an organization fully independent of external information technologies vendors. As the international European Union organization, the EITCI Institute offers academic standards of assessment and certification of information technologies skills and knowledge at the international level, as an independent educational standardization and accreditation body. Both the EITC and the EITCA Certification Programmes are available internationally on-line over the Internet within the network of partnering IT training companies and examination centers (EITCI Licensee Network). Please note that the EITCI Institute does not offer the EITC and the EITCA Certification Programmes to individual or institutional customers on its own. Instead the commercial offer for customers interested in obtaining EITCI IT certificates is available within the EITCI Licensee Network, assembling cooperating companies that offer direct services of on-line certification examinations optionally extended by certification program compliant stationary or non-stationary (e-learning) training services in a their country and language. The EITCI Certification Programmes are developed to be complementary with existing industrial IT certifications and to constitute an added value in a formal documentation of Information Technologies proficiency and area of competence.